Late one night I heard a radio report about a group of Irish piano tuners who travel to Cuba every year to repair the pianos there. I was very intrigued by this story and felt it may be something that could be developed further for a future project. At the time I had just begun working on the Steinway project so the idea on Cuba was filed away. By early 2009 and with the Steinway project coming to its conclusion I began to look at the next project. The Cuban project was still in my mind and so I began to conduct research into the project. By the middle of February I applied to the Cuban Embassy for my press visa and was informed that I would be informed about my application within a month. By the end of April I still had not heard back about my application and came to the conclusion that it had not been granted. As an alternative I began to look at a project in South East Asia. Our plan was to travel in the first week in June and I had allocated three weeks for the trip. On the day we were to book our flights for Asia my assistant rang me to say he could not travel as he didn’t have the proper vaccinations and his doctor had advised him not to travel without them. Disappointed that our travel plans had been cancelled it was back to the drawing board when later on that evening I received a telephone call from the Cuban Embassy that my visa had been approved and could I come to Dublin for an interview the following Tuesday. I received my Visa on the Tuesday and on the following Thursday I arrived in Havana. As I checked into my hotel I heard in the background was my name been called, when I turned around I saw two friends of mine from Cork waving at me, after a quick shower it was off to dinner and drinks and soak up the atmosphere of the city. During my stay I fell in love with Cuba and its people and even though I didn’t know it then it was the genesis for another project that would have return to the island again and again. Una Corda; In the back streets of old Havana and a world apart from the tourist trade is the National Workshop of Instrument Repair. When the Russians became Cuba’s close ally in the 1960s and 70s they used the workshop as a training centre for what is now the current generation of Cuban piano tuners and technicians. Two classes of blind and partially sighted tuners graduated from here, the first in 1970, and another class two years later. However, with the fall of the Soviet Union in the early 1990s, this training programme ceased and the workshop fell steadily into disrepair. Pianists in Cuba face challenges that most people in other countries can’t imagine. The island’s tropical climate is particularly hard on things made from wood, and the scarcity of supplies makes repairs virtually impossible. 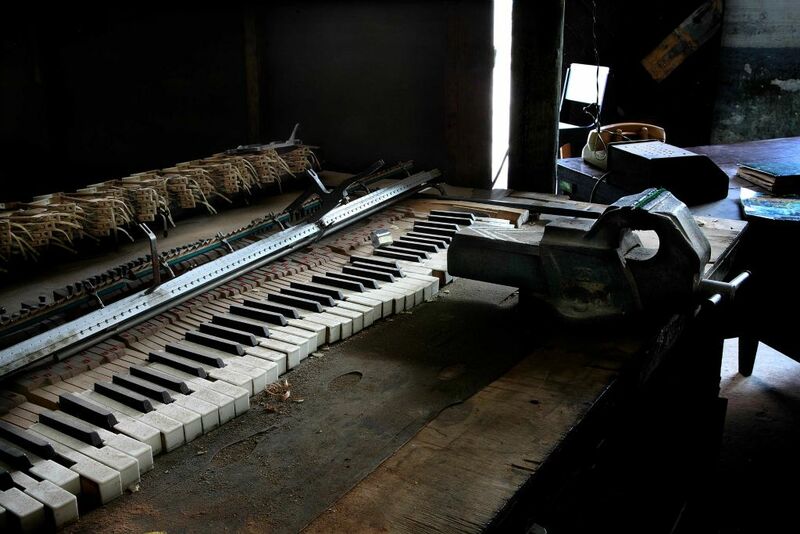 Now an Irish group is helping to restore thousands of pianos that have fallen into disrepair. Una Corda is a charitable non-profit organisation run by volunteers from Ireland’s music community. Since 2006, Irish piano tuners have been going to Havana to tune and help train local technicians. Working in conjunction with the Havana Arts Authority and the Cuban Ministry of Culture, the organization has three objectives: sending a small number of piano-tuners to Cuba to tune pianos and train people locally; helping to restore Havana’s National Workshop of Instrument Repair; and encouraging Irish people travelling to Cuba on holidays to carry piano parts with them, which Una Corda supplies. Over the last number of years tourists travelling to Cuba have made a real contribution to the project by becoming Una Corda’s couriers. Volunteers simply carry a package of piano parts or tools with them in their luggage when they go. So far, over three hundred kilos of parts have been carried in luggage, all with the approval of the Cuban authorities. The pianos that are being repaired and restored with the parts Una Corda supplies belong to Havana’s music schools. Up to twenty are in the workshop at any one time. Word has gone out across Havana and there are many more pianos in the queue in need of restoration. Over time the workshop itself is to be restored with money raised in Ireland. This entry was posted in cuba, photography, portfolios and tagged Cuba, havana, photography, piano, portraits. Bookmark the permalink.